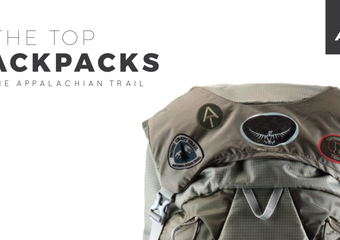 For the third year in a row, we asked Appalachian Trail thru-hikers and long-distance section hikers about the sleeping pads they used. 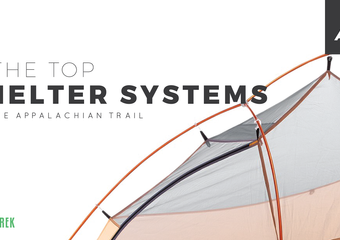 Many of the trends continued from last year, but we saw some differences when it comes to the kinds of sleeping pads hikers pair with different shelter systems. For the details, keep reading, or just check out the TL;DR at the end. 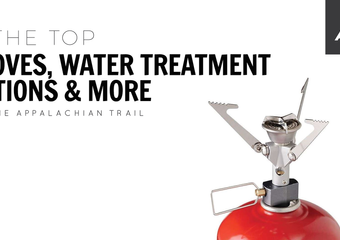 For general information on the hikers, check out this post. Sleeping pad types are pretty straightforward. The options are basically foam, inflatable, or combination/self-inflating pads that have a thin layer of foam and also rely on air for comfort. 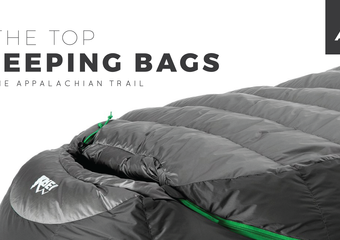 (For a more detailed explanation, check out Madi Dragna’s breakdown of sleeping pads). 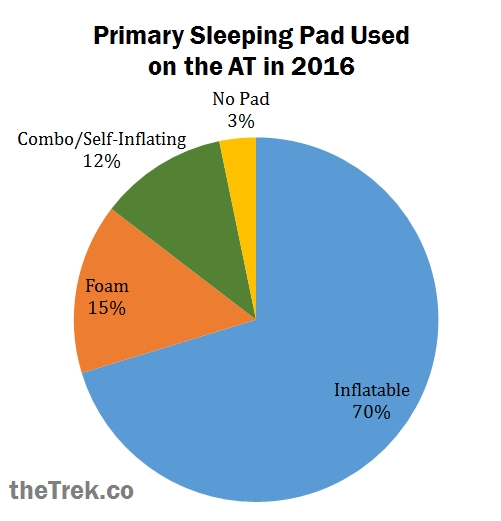 Inflatable pads continued to be the most popular type of sleeping pad, used by almost three quarters of hikers in the survey. Fewer hikers than last year changed sleeping pad models at some point during their trek; only 15 percent switched to a different model, compared to 30 percent last year. An additional ten percent replaced their pads with the same model, due to wear and tear such as inflatable pads getting holes. So, keep in mind that about 1 in 4 hikers had to buy a second pad before their hike was over. Still, nearly all hikers (90 percent) were at least somewhat satisfied with their sleeping pads. Although hammock users didn’t have a tendency for foam pads like last year, I still wanted to see if changes to shelter systems were related to changing sleeping pads. After accounting for age, gender, distance hiked, and type of sleeping pad, people who changed their shelter systems were more likely to change their sleeping pad.2 This could mean that some people just change up their gear more, but it could also be that hikers tend to prefer certain sleeping pads with certain shelters. If so, this suggests that it isn’t just important to have a good quality sleeping pad; it is important to have a pad that works well with the sleep system you chose. Be prepared to change pads (or be uncomfortable) if you change sleep systems, and vice versa. 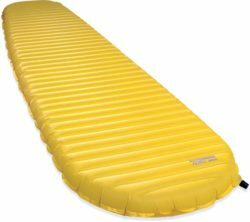 Because sleeping pads are generally cheaper and simpler than shelter systems, I suggest first testing out and determining your shelter system and secondly choosing a sleeping pad. 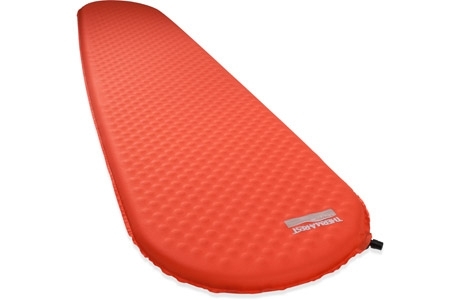 The predominant brand of sleeping pad was Therm-a-Rest, used by about three quarters (76%) of hikers in the survey. Big Agnes, Sea to Summit, Nemo, and other brands were used by the rest of the hikers. The most popular foam pad models were from the Z Lite series, used by at least 15 hikers. The most popular inflatable pads, and also the most popular pad series overall, was the NeoAir XLite series (including XLite Women’s, XLite Large, and XLite Short), used by at least 31 hikers in the survey. 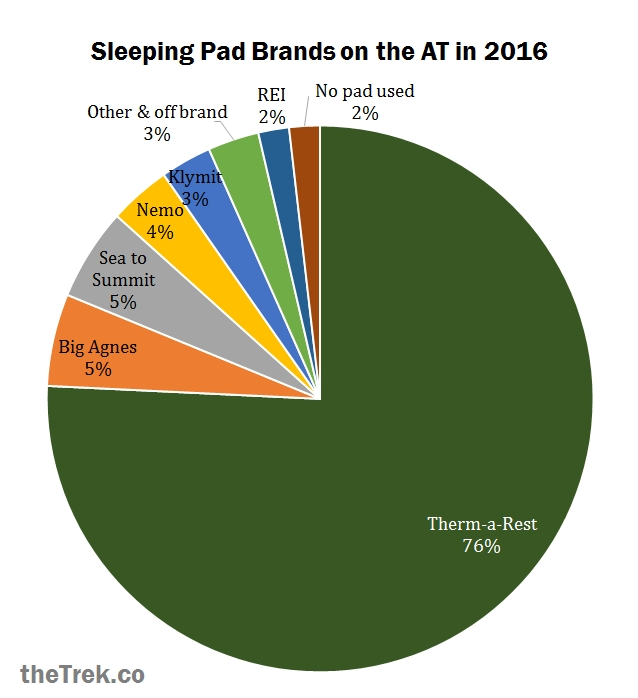 The most popular combination pads (self-inflating with a thin layer of foam) were from the Therm-a-Rest ProLite series (including Pro4, ProLite plus, and ProLite Women’s), used by six hikers in the survey. 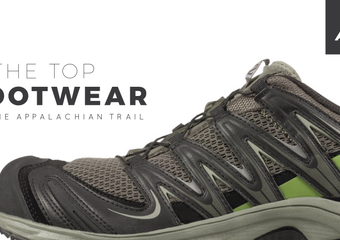 It should be noted that 25 hikers only said they used a “NeoAir” pad without specifying the model. NeoAir is the technology used by Therm-a-Rest in both their inflatable and combination pads, so it’s unclear what exact pads these hikers used. 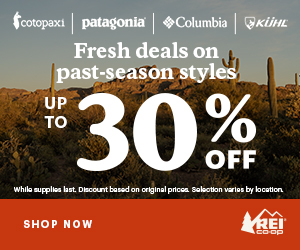 1 in 4 hikers replaced their pads, either with the same model or a different one. In particular, inflatable pads are prone to getting holes. Keep this in mind when budgeting, and take care of your pad! Inflatable pads are the most popular sleeping pad type among AT long-distance hikers, and among tent users in particular. The most popular inflatable models are from the Therm-a-Rest NeoAir XLite series. 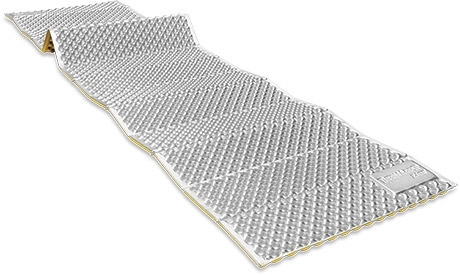 Combination/self-inflating pads, considered more lightweight than foam pads and easier to use than inflatable pads, are newer and still only used by a minority of hikers. The most common models are from the Therm-a-Rest ProLite series. Matching your pad to your shelter system appears important enough that hikers who switch shelter systems will likely switch sleeping pads as well. Because sleeping pads are generally cheaper and simpler than shelter systems, I suggest first testing out and determining your shelter system and secondly choosing a sleeping pad. Inflatable pads were more popular with hammock users this time than they were last year. Still, if you’re using a hammock, you may want to try it out without a sleeping pad (in cold conditions and probably with an underquilt), because you may decide you don’t need a pad. It was uncommon for hikers to forgo sleeping pads altogether, and those who did were predominantly hammock users. Unless you plan exclusively to hammock, never using the lean-to shelters, it is not recommended that you go without a sleeping pad. 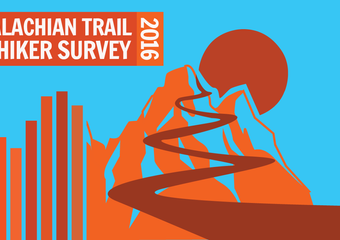 Congratulations to all who completed section and thru-hikes in 2016, and many thanks to those who participated in the survey. Thanks also to Zach Davis for his assistance and his patience as it took me awhile to post this. This is the final post in this series from our 2016 survey. Check out the previous posts on general information, backpacks, footwear, shelter systems, sleeping bags, and stoves, food, and water. A Chi-Square test of independent samples was conducted on sleeping pad use by shelter system. X2 = 30.63, df = 4, N = 186, p < .001. Post hoc tests were conducted interpreting standardized residuals as z-scores. Hammock by No Pad z = 5.1, p < .001. A binary logistic regression was conducted predicting switching sleeping pad type (1) vs. same model replacements or no change (0). Age, Gender, and Distance Hiked were entered in Block 1; Sleeping Pad Type and Changed Shelter Models were entered in Block 2. The final model was not significant (p = .062). The only significant predictor was Changed Shelter Models (p = .002, Odds Ratio = 5.30, B = 1.667).